Publisher: Small, Maynard, and Co. 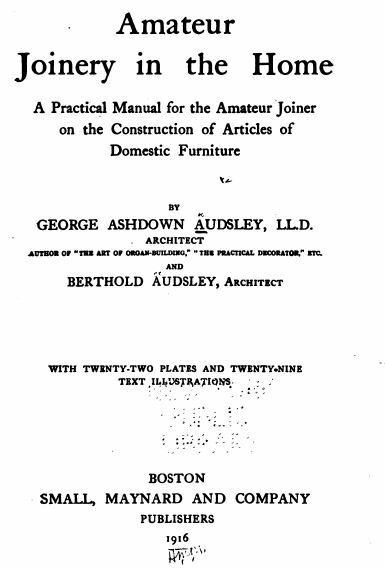 In offering this Manual to the amateur interested in the Art of Joinery, we trust it will be found sufficient, in all essentials, to instruct him in the methods of woodworking necessary for the easy construction of articles of use and beauty. It has been written in the simplest and most concise way it can be, so as to prevent any confusion or misunderstanding in the mind of the amateur woodworker. Included is a list of designs, carefully drawn and detailed to scale, such as never before in a handbook on the Art of Joinery.